Expendables 3 began filming today in Bulgaria, and with it comes the official announcement of the cast. Returning from previous missions, we have Sylvester Stallone, Jason Statham, Jet Li, Dolph Lundgren, Randy Couture, Terry Crews and Arnold Schwarzenegger. However, this time, they will be joined by several new faces including: Wesley Snipes, Antonio Banderas, Harrison Ford, Kellan Lutz, MMA star Ronda Rousey, welterweight boxing champion Victor Ortiz, Glen Powell, and Mel Gibson. Gibson will be playing Conrad Stonebanks, Barney’s (Stallone) ex-Expendables co-founder who’s back with a personal mission of vengeance to end the mercenary gang. 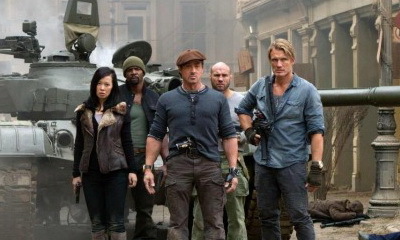 Expendables 3 is set for an August 15th release.